Working with our friends at Brazos Walking Sticks, we have created the ultimate walking stick for Geocachers. The new Trackable Travelers Stick (TM) offers the quality and stability of a traditional handcrafted walking stick, while conveniently unscrewing into three equal parts, making it perfect for easy storage and travel. When disassembled, the entire unit is only around 19 inches long, so it'll easily stow away in an airplane overhead bin, in your backpack, or even on the passenger's seat of your car. With its small and discreet disassembled size, this staff can be taken virtually anywhere. In a popular 55-inch assembled size, the oak Travelers Stick is sized just right" for the majority of people looking for a handcrafted walking stick to conveniently carry with them on their geocaching adventures. Furthermore, each Traveler's Stick is also outfitted with a versatile Combination Spike, making it perfect for trekking on pavement, or off the beaten path. 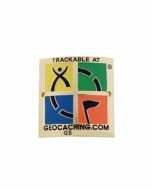 We have even added a unique tracking code to each stick making it discoverable while you are out caching. This unique handcrafted walking stick is made in the USA by the skilled craftsmen at Brazos, using time-tested woodworking methods. It comes in Tan, Brown or Red. To learn more about trackable items, visit the trackable item website.